After routing, your layout is complete. Now a number of checks are performed to verify that the drawn layout works as intended. Equivalence check will compare the netlist we started out with (pre-layout/synthesis netlist) to the netlist written out by the tool after PnR(postlayout netlist).Physical verification will verify that the post-layout netlist and the layout are equivalent. i.e. all connections specified in the netlist is present in the layout.This article explains physical verification. After routing, your PnR tool should give you zero DRC/LVS violations. However, the PnR tool deals with abstracts like FRAM or LEF views. We use dedicated physical verification tools for signoff LVS and DRC checks. Some of these are Hercules from Synopsys, Assura from Cadence and Calibre from MentorGraphics. DRC checks determine if the layout satisfies a set of rules required for manufacturing. The most common of these are spacing rules between metals, minimum width rules, via rules etc.There will also be specific rules pertaining to your technology. An input to the design rule tool is a ‘design rule file’ (called a runset by Synopsys’ hercules). The design rules ensure sufficient margins to correctly define the geometries without any connectivity issues due to proximity in the semiconductor manufacturing processes, so as to ensure that most of the parts work correctly. The minumum width rules exists for all mask layers, and spacing between the same layers are also specified. 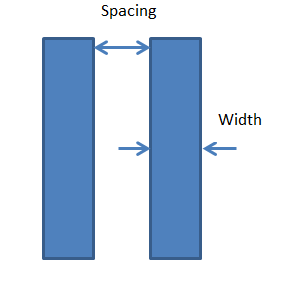 Spacing rules may change depending on the width of one or both of the layers as well. There can also be rules between two different layers, and specific via density rules etc. If the design rules are violated, the chip may not be functional. DRC checking software, like Assura, Hercules or Calibre usually takes the layout in any of the supported formats, like GDSII. LVS is another major check in the physical verification stage. Here you are verifying that the layout you have created is functionally the same as the schematic/netlist of the design-that you have correctly transferred into geometries your intent while creating the design. So all the connections should be proper and there shouldn’t any missing connections etc. If the two netlists match, we get an LVS clean result. Else the tool reports the mismatch and the component and location of the mismatch. Along with formal verification, which verifies if your pre-layout netlist matches the post-layout netlist,LVS verifies the correctness of the layout w.r.t intended functionality. Shorts – Wires that should not be connected are overlapping. Opens – Connections are not complete for certain nets. Parameter mismatch – LVS also checks for parameter mismatches. e.g. It may match a resistor in both layout and schematic, but the resistor values may be different. This will be reported as a parameter mismatch. Unbound pins – If the pins don’t have a geometry, but all the connection to the net are made, and unbound pin is reported. 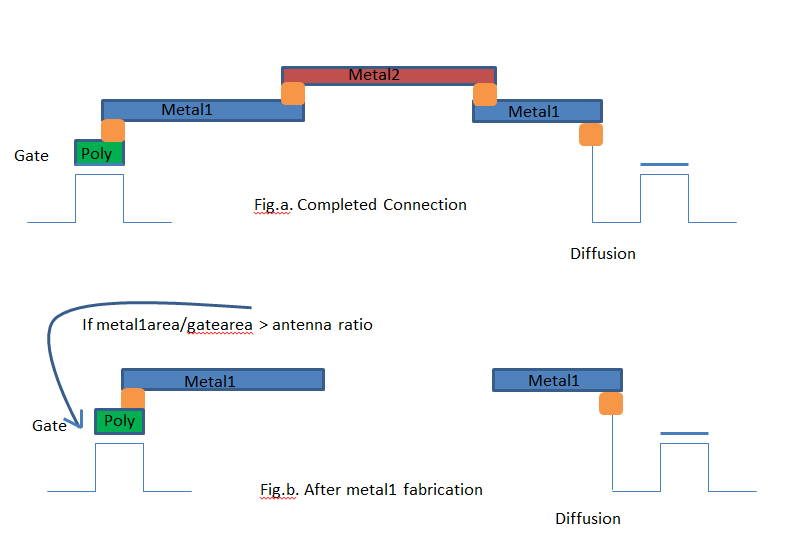 Process antenna effect or “plasma induced gate oxide damage” is a manufacturing effect. i.e. this is a type of failure that can occur solely at the manufacturing stage. This is a gate damage that can occur due to charge accumulation on metals and discharge to a gate through gate oxide. Let us see how this happens. In the manufacturing process, metals are built layer by layer. i.e. metal1 is deposited first, then all unwanted portions are etched away, with plasma etching. The metal geometries when they are exposed to plasma can collect charge from it. Once metal1 is completed, via1 is built, then metal2 and so on. So with each passing stage, the metal geometries can build up static electricity. The larger the metal area that is exposed to the plasma, the more charge they can collect. If the charge collected is large enough to cause current to flow to the gate, this can cause damage to the gate oxide. This happens because since the layers are built one-by-one, a source/drain implant may not be available for discharge as in fig.b. Antenna rules are normally expressed as an allowable ratio of metal area to gate area. Each foundry sets a maximum allowable antenna ratio for its processes. If the metal area–which is cumulative, i.e. the sum of the ratios of all lower layer interconnects in addition to the layer in check–is greater than the allowable area, the physical verification tool flags an error.For example, let’s say maximum allowable antenna ratio for metal1 is 400. If the gate area is 1 sq.u and if the metal area connecting to the gate is 500 sq.u, there will be a process antenna violation. ERC (Electrical rule check) involves checking a design for all electrical connections that are considered dangerous. Floating gate error – If any gate is unconnected, this could lead to leakage issues. VDD/VSS errors – The well geometries need to be connected to power/Ground and if the PG connection is not complete or if the pins are not defined, the whole layout can report errors like “NWELL not connected to VDD.